When I was growing up I began to struggle with the difference between how the Bible says women should be treated and the way they were treated. I was happy we weren’t following the Bible’s teachings, I felt women should be the equals of men, but how can you claim the Bible is the word of God and then choose to ignore the words? Were people created in God’s image or the other way around? The teachers I talked to never gave a convincing answer, mostly just that it was a cultural difference, but that didn’t make sense to me as it was a cultural difference back then too. I started reading the Bible cover to cover and struggled with some of the old heroes of the Bible, some of whom seemed to me to be monsters, and sometimes God too. And then I got to Judges Chapter 4. Deborah, a prophetess, the wife of Lappidoth, was leading Israel at that time. According to Judges, Deborah was not just the person the people chose as judge, but also the person God chose as prophet. God tells Deborah he’s going to give Israel a great victory against their oppressors, so she tells her commander to gather his troops. Such is the commander’s faith in her and in God’s faith in her, and such is his fear of the fearsome chariots of the enemy, that he says he will go but only if she goes with him. She goes, and rout the enemy they do, not just in this battle but in others that follow. The book of Judges has many judges set as examples, some as good and some as bad, but Deborah is one of the greats. So I began to wonder, why is her story forgotten, why did our religion choose sexism instead, to the harm of billions over thousands of years? And not just sexism, but racism, and homophobia, and on and on? I eventually decided the Bible was not the words of God but the words of men trying to understand the nature of God, and of themselves. If you take the Bible at its word, two generations grow up in peace because of one woman, their judge and God’s prophet. God took delight in her, pity we don’t. 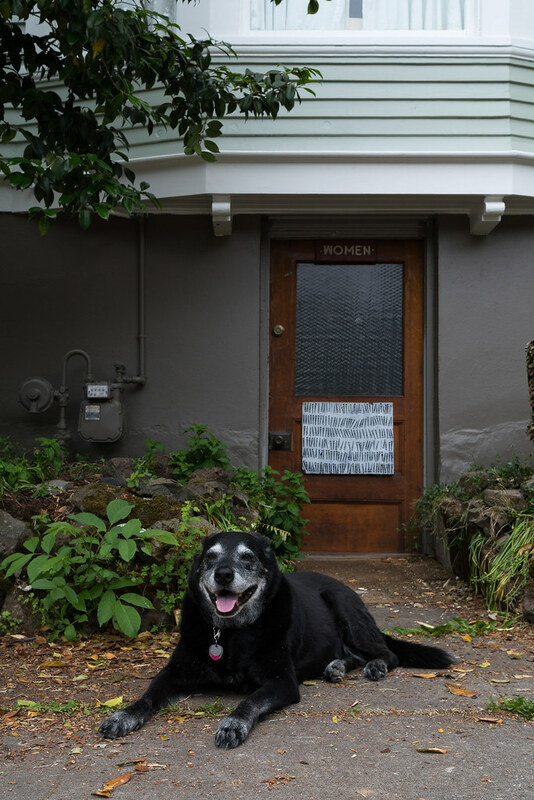 This entry was posted in General, Pets and tagged black lab, dog, Ellie, Irvington, Oregon, Portland, sitting. Bookmark the permalink.